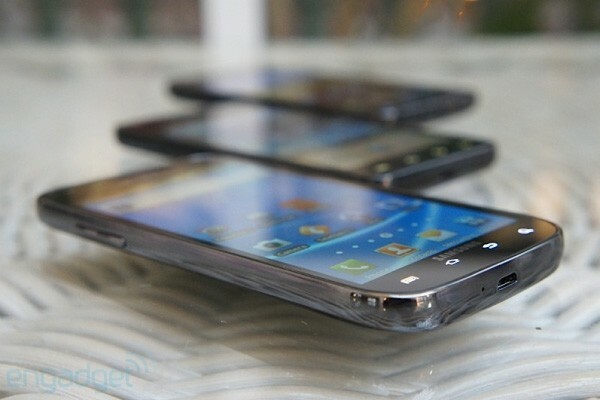 Well, we know there’s an LG event right around the corner and, if we were the betting type, we’d put our money on the flagship Optimus G making its stateside debut. Perhaps the biggest clue to what the company has up its sleeve is that the quad-core Snapdragon S4-powered handset just made its video debut. The sleek 4.7 inch handset is staring in its own commercial, currently posted on YouTube, that will be airing in the manufacturer’s homeland shortly after launch. The brief clip doesn’t tell us anything we didn’t already know, but we can’t find any reason complain about a few extra peeks at it before release. Check out the video after the break. 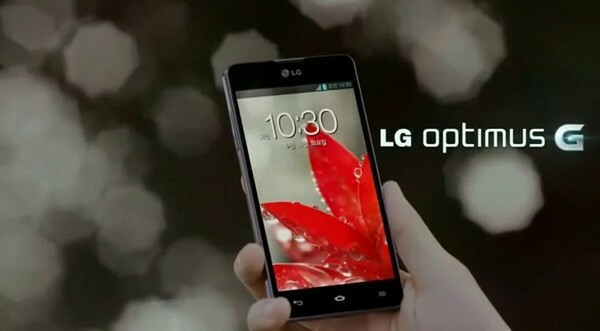 LG Optimus G makes its commercial debut in Korea (video) originally appeared on Engadget on Fri, 14 Sep 2012 17:04:00 EDT. Please see our terms for use of feeds. Verizon has never totally been on the Google Wallet bandwagon. First, Big Red refused to support the mobile payment system, citing its dependance upon proprietary hardware. Months later, some folks managed to gain access through the Play Store, but it looks like that the VZW GNex is, once again, Wallet-free. 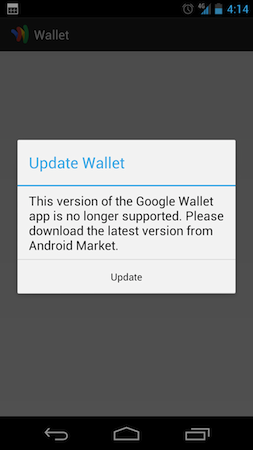 Word on the web has it that those Nexus owners are now, upon opening the app, greeted by a message saying that their version of Google Wallet is no longer supported, and that they need to update the app. Problem is, the Play Store is telling folks that their devices are no longer supported. We’ve confirmed the issue ourselves, but we don’t know if this a temporary problem, or if it’s a permanent move. We’ve reached out to both Google and Verizon for comment, and we’ll let you know as soon as we hear back. Verizon Galaxy Nexus owners lose Google Wallet access (update) originally appeared on Engadget on Fri, 14 Sep 2012 16:43:00 EDT. Please see our terms for use of feeds. Allegations of misleading advertising practices among Canada’s big telecom companies has been a recurring subject for some time, and it’s now been brought to the fore once again in the form of a multi-million dollar lawsuit. The country’s Competition Bureau announced today that, after a five-month investigation, it has decided to sue all three carriers and the industry group that represents them over ads that promote so-called premium texting services. In addition to demanding that such ads stop, the government agency is seeking full customer refunds for any charges incurred and a $10 million penalty from each carrier, plus an additional $1 million from the Canadian Wireless Telecommunications Association. For its part, the CWTA has unsurprisingly taken issue with the lawsuit, saying in a statement that it reached out to the Bureau last year to discuss the issue, and that its actions today “could disrupt the text message services, such as severe weather alerts, charitable donations, flight status updates or sports scores, on which millions of Canadian consumers depend.” You can find that full statement, and the Competition Bureau’s announcement of the lawsuit, at the links below. Canada’s Competition Bureau sues Bell, Rogers and Telus over alleged misleading advertising originally appeared on Engadget on Fri, 14 Sep 2012 16:40:00 EDT. Please see our terms for use of feeds. This entry was posted on September 14, 2012, 5:49 pm and is filed under Mobility. You can follow any responses to this entry through RSS 2.0. Both comments and pings are currently closed.